The eProphet Payroll system is designed to be the perfect franchise payroll software solution for franchise QSR operators - particularly those who have previously used systems such as Sybiz, McProfits, Vandoes or Cosmos. As the successor to our legacy franchise payroll software that has served businesses for over 20 years, eProphet Payroll has been built on a foundation of that experience and enhanced further to ensure it can handle every complexity of modern franchise labour industry awards and regulations. 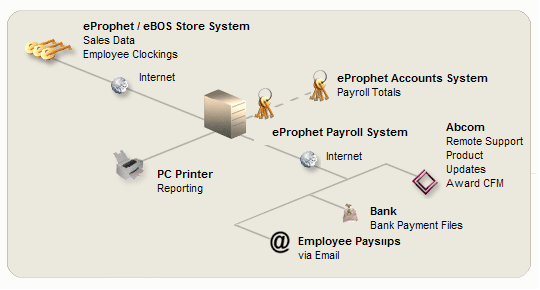 The payroll software system accepts comprehensive electronic input of employee clockings, rostered times and employee master file update data from a store eProphet/eBOS system. This data, along with a minimum of sundry input by the payroll administrator, is processed by a powerful payment calculation engine to produce fast and accurate employee payments. Upon finalisation of each payroll run important records for the employer, employees, the ATO and other relevant parties such as superannuation funds are automatically updated by the system. Transfer of employee payment totals to your banking institution is quick and easy and employees can receive their payslips via email automatically if desired. The system can easily produce a comprehensive set of reports at the touch of a button, allowing you to analyse every aspect of your payroll operation and maximise the profitability of your business. Developed and designed using advanced Microsoft® .NET™ framework technology, eProphet Payroll represents a long term quality software investment for your business in a field where robust and proven software is a prerequisite.